The Delaware County Board of Developmental Disabilities has proclaimed today — Thursday, March 21 — as Crazy Socks Day in Delaware County as a way to promote inclusion and celebrate the month of March as Developmental Disabilities Month. 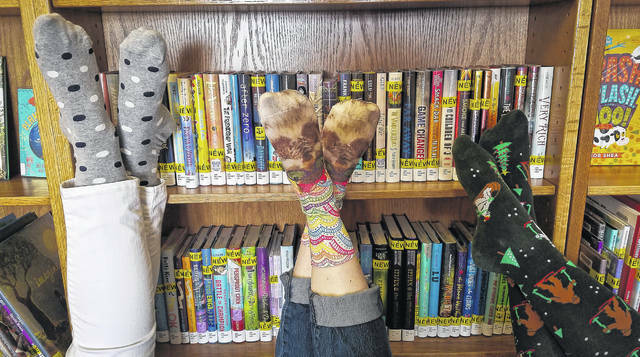 As a community partner, the employees of the main branch of the Delaware County District Library took a moment to prop up their feet to show off their socks for Crazy Socks Day. Delaware County Board of Developmental Disabilities (DCBDD) proclaimed today — Thursday, March 21 — to be “Crazy Socks Day” in Delaware County to celebrate inclusion and bring awareness to National Developmental Disabilities Awareness Month (NDDAM). In 1987, President Ronald Reagan proclaimed March as “Developmental Disabilities Awareness Month.” In his proclamation, he called upon all Americans to provide inclusion, “encouragement and opportunities” for people with developmental disabilities, to help them reach their potential. “It is our hope that these socks are a conversation starter that opens up the dialogue to Developmental Disabilities Awareness Month,” DCBDD Superintendent Kristine Hodge said. Currently, over 2,300 people with developmental disabilities receive the services and support offered by DCBDD. The students and staff of the Olentangy Local School District, Delaware City Schools, Delaware County District Library, City of Powell, Delaware Speech and Hearing, Delaware County Special Needs Registry/EMS, DATA Bus and DCBDD were encouraged to wear brightly colored and crazy socks as a fun way to bring awareness to developmental disabilities. Anne Miller, DCBDD public information officer, said this is the first year DCBDD has participated in Crazy Socks Day as a way to bring awareness to and start a conversation about all developmental disabilities. However, she confessed that the idea of Crazy Socks Day was an idea borrowed from World Down Syndrome Day (WDSD), which is celebrated every March 21 to bring awareness to Down syndrome. The United Nations has officially observed WDSD internationally since 2012. Jen Ruhe, Delaware City Schools director of communications, said it’s important to bring awareness to the special abilities of the students with special needs. “Our Delaware City School students and staff are proud to join our friends from other schools and agencies in sporting crazy socks in support of people of all abilities,” she states in a press release from DCBDD. This entry was tagged Anne Miller, Crazy Socks, D. Anthony Botkin, Delaware County Board of Developmental Disabilities, Inclusion, Kristen Hodge, World Down Syndrome Day. Bookmark the permalink.